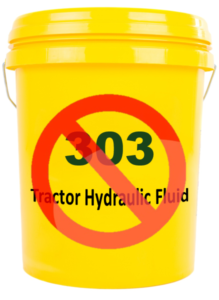 Effective immediately, the State of Missouri has banned all tractor hydraulic fluids labeled solely as “303.” These products, also commonly known as “yellow bucket,” are low quality yet represent a significant portion of the US tractor hydraulic fluid market. The so-called “303” or “yellow bucket,” refers to an old John Deere specification that has been obsolete since 1974. Missouri has determined that products claiming only “303” are misleading since there is little/no relevant equipment in use today manufactured prior to 1974 and there is no way to test and validate the claim. Lubrizol has long advocated for the use of higher quality lubricants, especially as it relates to THF and Yellow Bucket Fluids.This was one of the driving forces behind the formation of the Tractorlife Authenticated program.